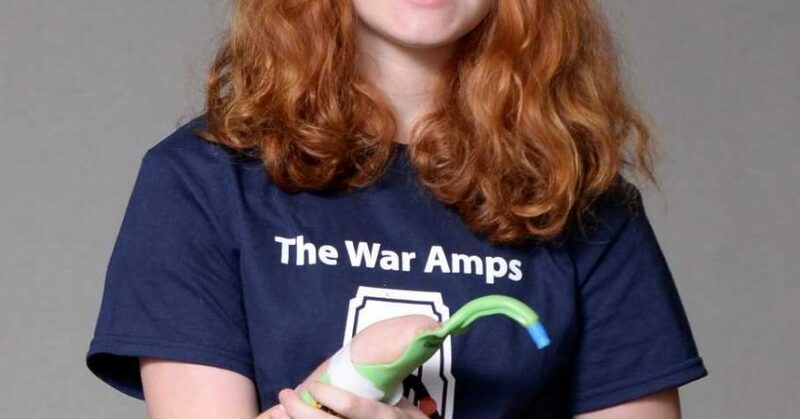 Emma Coakley, 13, of New Brunswick, is a member of The War Amps Child Amputee (CHAMP) Program. She is showing the device she uses for typing, which was funded thanks to public support of the Key Tag Service. The Key Tag Service was launched after the Second World War so that returning war amputee veterans could not only work for competitive wages, but also provide a service to Canadians that would generate funds for the Association. The War Amps receives no government grants. With the public’s support of the Key Tag Service, the Association is making a difference in the lives of amputees by providing financial assistance for artificial limbs, peer support and information on all aspects of living with amputation.